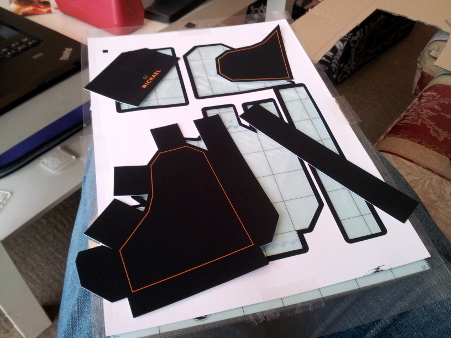 The card's skeleton is made out of an old cardboard box cut into a net and glued together using hot glue. The skin was printed on some matte-finish printer card and cut out using my handy reverse-engineered Silhouette Portrait cutter/plotter. Luckily, the circuit board fit so well it didn't even need gluing in place and so it can be easily removed should it need upgrading (or more likely fixing...)1. 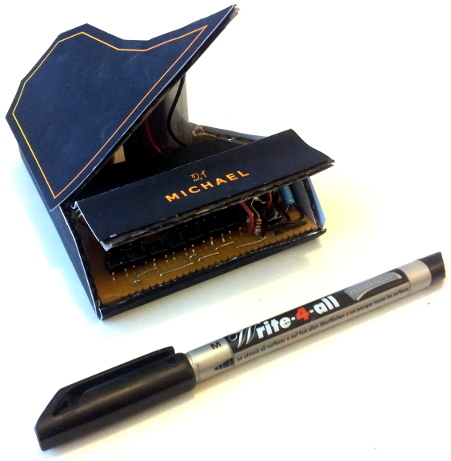 The 9V battery also very handily serves as a prop for the lid of the piano! in an easy-to-solder DIP package. I bought a few of these a while back out of a desire to have a selection of so-cheap-they're-nearly-disposable microcontrollers on hand for projects just like this. cheap, clicky and perf-board friendly. Harvested from a discarded circuit board in a lecturers' office, presumably the remains of a printer. nothing special, scrounged from various sources. a low drop out 5V regulator pilfered from university supplies. 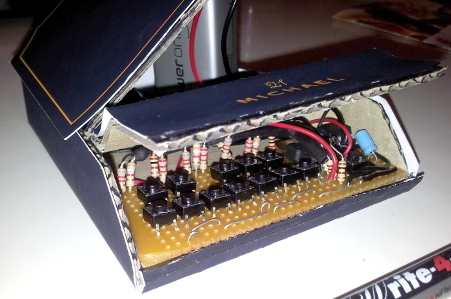 Though an inefficient way to run off a 9V battery, that isn't a problem for this project. cheap and cheerful (and with no built-in controller). The ATtiny really lives up to its name and unfortunately this comes at the expense of the pin count: a mere 8 pins. Given that two of these would be taken up by power connections and a third by the reset signal2. This left 5 pins through which to connect 13 buttons (12 piano keys and a modifier switch) and a piezo to make the sound. 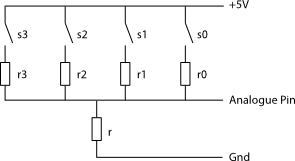 Traditional approaches to connecting large numbers of switches to only a small number of pins use row/column scanning but this has the limitation that some combinations of key presses can be ambiguous. This is fine for a keypad where only a small number of keys would be pressed at once but since a musical keyboard must support arbitrary chording of keys, an alternative was needed. With the number of buttons multiplexed are limited to four and the resistors are chosen as roughly powers-of-two, the range of values for all possible key-presses is kept reasonably far apart meaning that it is easy to distinguish between all possible key combinations. With three analogue inputs and twelve keys, this works out ideally leaving two pins for the mode button and piezo. The code is available on GitHub if you really wish to take a peek. 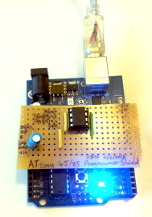 As mentioned, the show is run by a single ATtiny85. Luckily this tiny chip can be programmed via the Arduino IDE or choice of Makefiles which makes using it very pleasant for people who are lazy or lacking in proper microcontroller development skills. Indeed you can even program it using an appropriately programmed regular Arduino meaning I didn't need to buy any fancy hardware. The down-side is that unlike the regular Arduino, some library functions are somewhat poorly supported. In particular the tone(), noTone() functions which I was hoping to use to generate the required sounds didn't work. Though others claim to have fixed this issue, the implementation didn't generate the correct frequencies. As a result I simply implemented them by hand using the ATtiny's internal timer/counter. Given that I was lazy, I ended up doing this using an interrupt (starting from some semi-functioning examples found online) rather than doing it properly using the PWM generator. The other issue is that working on a tiny 8-bit microcontroller doesn't lend itself to doing floating point calculations for working out the analogue input values for all the possible button presses. As a result I wrote a small python script which, given a set of resistor values, produces an #include-able code snippet with the analogue values pre-computed in a look-up table. This is also the first project I've done using an ATTiny and while I was largely pleased with how Arduino-ey it was, it definitely required substantially more effort than its dev-board dwelling cousin. Having said that, much fun was had and I'm very pleased with how well the analogue key multiplexing.